After graduating with First Class Honours from Massey University in New Zealand with a Bachelor of Design, majoring in Fashion Design, Nadine Jäggi jumped on a plane to Switzerland, where she completed a short stint in Europe working at the Stadttheater Bern, the Capital Theatre. Here, Nadine was employed as a costume assistant, which allowed her to work with all aspects of design and dressing for theatre. 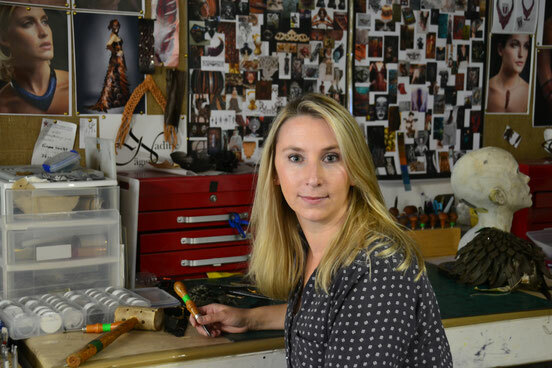 In 2006 she arrived back in New Zealand and started working at Weta Workshop. Since then, she has been involved in a variety of projects such as Prince Caspian, Avatar, District 9, Day Breakers and the Hobbit, as well as some work for the Royal NZ Ballet and Radio NZ. Some of Nadine’s talents include costume construction, textile manipulations, leatherwork, creature suit fabrication, muscle suit fabrication and hair/fur work. Nadine has won several awards to date. In 2008 she won the South Pacific Section, followed by the supreme award at the Montana World of Wearable Art Awards for her leather creation "Ornitho-Maia". This wasn't the first time Nadine entered the WOW Awards. Prior to joining the team at Weta Workshop, Nadine won the Tertiary Student Design Award for her creation, ‘Reaching Out'. The same year, Nadine was a finalist for the Tertiary Student Achievement award at the Wellington Fashion Awards. Nadine is currently exploring leather further as her favorite medium, creating one off costumes and leather accessories.